At the beginning of the year, I sat down with Jonathan Jacques-Belletête, the Art Director of Deus Ex 3, to talk about Deus Ex: Human Revolution’s baroque influence, how Warren Spector helped them justify the style differences with Deus Ex 1, and why the future will be yellow. This originally appeared as a piece on IGN. Have any particular artists inspired you for the style of the game? As an Art Director, videogames are always my last point of reference, I like to look at a whole bunch of stuff first. I’m really big into architecture and fashion and stuff like that so, you know, like Tadao Endo and the Scandinavian architects; the idea is that cyberpunk is never really far in the future, it’s just an anticipation, right, grafting of the old onto the new. We travel internationally in the game but a big part of it is in Detroit and I was asking myself how am I going to make it look futuristic and kinda the European contemporary architecture like in Scandinavia, we don’t have much of that in North America and just by putting that in Detroit in front of those old buildings from the 30s and stuff like just makes it look futuristic and credible and if someone says to me that’s too futuristic I can say “those buildings exist right now in Japan and Scandinavia and London and so on.” I’m a big industrial design freak. Do you think the Bladerunner Cyberpunk style is old hat? Because Cyberpunk’s been done quite a bit I wanted to bring something new to it and I started analysing all the transhumanist themes and quite rapidly you start seeing this connection with the renaissance period because it was about all the humanistic stuff and we’re dealing with all this transhumanistic stuff; the renaissance was, if you want, the beginning of the transhumanist era. If you want to upgrade a system, you first need to be able to understand how the system functions at its basics and the renaissance is the first time in the west when we start going back into antiquities research and all that, and understanding the human machine. That’s where transhumanism starts, understanding how the machine functions, and then in 2027 we upgrade that machine. …And then how do you tie this high aesthetic concept into the game proper? And then I said ‘Eh, what happens if I actually mix the aesthetics from the renaissance with the baroque and the cyberpunk stuff -would that be a cool flavour? Would people say that’s cyberpunk but it just belongs to that product?’ so… yeah, Vermeer, the renaissance and the baroque -the black and gold palette, the Rembrandt stuff, night and candles. the black represents the dystopian aspect of the game, the gold represents the human fleshy thing, which is so much of what we deal with and also a little bit of the hope that’s still in the world at that time before the big collapse. Do you feel there were any design limitations in that you had to move between our time and the original Deus Ex, knowing what the future was going to be? We didn’t really think about it that way; we thought let’s do our homework about where things are going to be in 30 years and let’s base our stuff on that. At that point, whether it matches or doesn’t match 100% with the first game, we didn’t care that much. 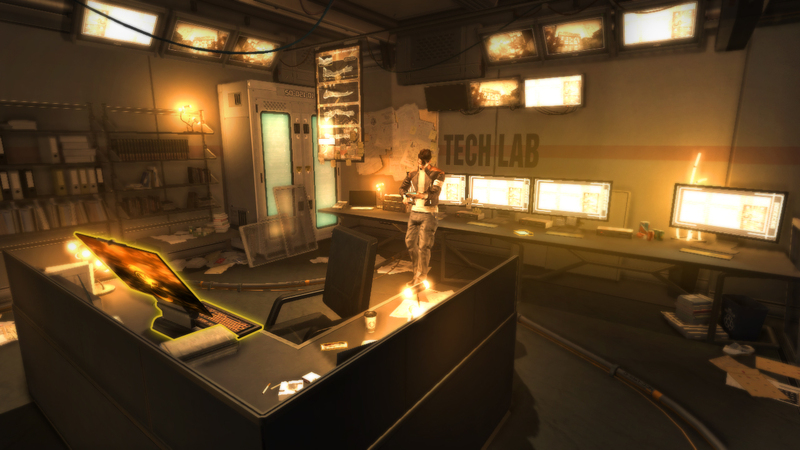 Not in a non-respectful way, but in a way that it was more important for us… because a lot of the tech in the first Deus Ex is outdated now; a lot of the televisions are still 4:3 ratio and already today our world looks more futuristic than the first Deus Ex. Also, I remember talking with Warren Spector about this (he hasn’t worked on the game at all not even as a consultant, I’ve just bumped into him), even he said “hey, maybe we just visited the really gritty places of the world in the first one and all the stuff you’ve done was already extant, it’s just not where the player went.” I was like… “thank you, Warren” (laughs). Is there anything in the game you’ve not justified in the fiction? Everything’s justified. We really went nuts with all that stuff. We had over four writers, including some great SF guys, like James Swallow who writes for Games Workshop. Our lead narrative writer Mary rally supervised it, but pretty much all our writing team are detail freaks. If the world turns out how you’ve projected it, how will you feel about it? …and you spend all your time going down at the shop trying to get them repaired. (giggles) so yeah, we think the next thirty years are going to be really crazy but if it turns out like our design… it’s going to be really yellow (guffaws). (I spot his tattoo) Is that… Warhammer? Eldar? Yeah… (shyly) I was a lot younger. Has that had any influence on Deus Ex? Not really. Maybe the freakish attention to detail, because it’s one of the best crafted universes, the 40K stuff. More stuff like Metal Gear. Would have been nice to have a little space marine on someone’s desk in the game, or in his apartment, you infiltrate it and you’re like “omigod, this guy’s a Games Workshop painter”. There’s one thing a lot of futuristic things don’t do is have lots of throwback to the past, apart from something like Bioshock that was specifically designed like that. One of the things we try to do in Deux Ex is to always surprise you, so you may walk into that bank lobby and there’s this really weird installation art thing hanging from the ceiling made from recycled anything in this shape that’s going to shock you, and why’s it there? It’s there because it’s interesting. Previous Post Previous post: Journalism; when is it justified for a writer to work for free?